Milanese Gremolata Infused Olive Oil is one of Cultivated Tree’s most versatile olive oils! 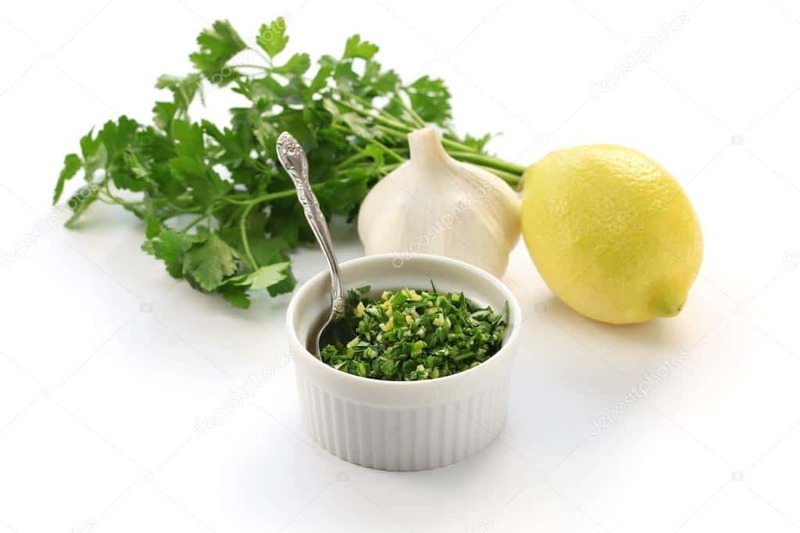 Traditional Gremolata is a condiment used widely in Italy, and many European countries, consisting of lemon zest,minced garlic, Italian flat leaf parsley and a bit of mint. So, this lovely infused olive oil is great with a wide variety of proteins: chicken, fish, seafood and pork! It is a staple for Osso Buco. Versatility is the name here – so now think of the veggies you prepare that come to life with a bit of lemon … drizzle them with Milanese Gremolata. I have more mom’s tell me the kids are eating their vegetables because of this infusion. They simply taste better. A combination of Milanese Gremolata and Sicilian Lemon White Balsamic is one of our most popular combinations for a vinaigrette. A simple meal for any day of the week yet elegant enough to serve when entertaining. We've gone back to the basics for this delicious version. Often featured in our cooking demonstrations and always a hit. We hope you enjoy! 6 6-8 oz boneless skinless chicken breasts - tenders removed I like air chilled myself - they actually retain juice better and are more tender. Gather a large oven proof platter and piece of foil for tenting chicken. Pre-heat oven to 180°, with rack in the middle position. Season flour with salt and pepper for dredging chicken on a plate or shallow pan and set aside. Cut 1 lemon in half - trimming ends off - then slice 1/2 into thin half moons. Juice the remaining 1 1/2 lemons - this will be used for the sauce at the end of cooking the cutlets. Cut each chicken breast in half horizontally - resulting in thinner breasts. Place them in an unsealed zip-lock bag and pound them to an even 1/4 inch thickness using a meat pounder. A good substitute is a rolling pin used like a mallet. Pat the cutlets dry with paper towels and then dredge each one in the flour mixture - shacking off the excess. Transfer to a single layer to a large platter. Preheat a large skillet to a medium high heat then add 3 tablespoons of the Milanese Gremolata Infused Olive Oil. Without crowding, add 3-4 of the dredged chicken cutlets and let cook until nicely golden - about 3 minutes. Flip and cook the other side the same which should only require about 2 minutes. Remember they are only 1/4 inch thick. Remove and place on the oven proof platter and tent with foil and place in the warm oven. Repeat this process with the other cutlets - adding remaining olive oil prior to starting. Add chicken to oven dish when complete. When the cutlets are finished - saute the minced shallot in the same skillet until it is fragrant - about 45 seconds. Stir in the chicken broth and half moon lemon slices and simmer - scraping any bits from the pan (fond) and reducing the liquid to about 1/3 cup. Stir in the rinsed capers and lemon juice and reduce again. Remove from heat and add butter a few pieces at a time. 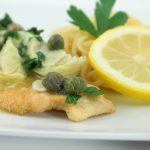 Add the parsley, stir and pour the sauce over the warming platter of cutlets - or plate each serving with cutlet and sauce and serve with a side of pasta drizzled with olive oil. Enjoy! NOTE: Use a large gallon size sip lock bag to pound the breasts to 1/4 inch thickness - you can add a few horizontally sliced breasts and scoot them around as they are finished. Or just cover with butchers paper or plastic wrap and pound away!